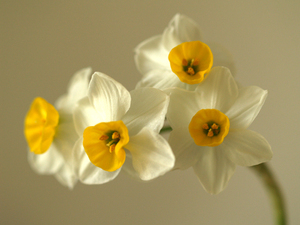 Paper white narcissus grew in my mother's garden in the harsh desert climate of southern Nevada. They grew outside as well as in the large indoor "window box" garden that my grandfather built for her in the kitchen...at least that's what i call it...i have never seen anything like it since so i have no idea what else it might be called. The window box was behind a bay-type window that constituted the entire end wall of the kitchen. It was about 8 feet long and 3 feet deep and filled with soil. My mother grew mostly tropical plants in it, and my father rigged a little circulating water fall feature within a large volcanic rock they had collected from the desert. The kitchen table stood in front of this indoor garden and in the winter, we dined with the luscious fragrance of paper white narcissus accompanying every meal. i stopped buying unnamed bulbs locally and combed through catalogs for named bulbs with a description that included "pleasant fragrance." Whoever wrote those catalogs should be fired...the fragrance may have been less foul, but was not anywhere near "pleasant." loss of color and decidedly unappetizing fragrance. i am thrilled to report that Brent does not exaggerate when he describes the wonderfully sweet fragrance of these flowers in his catalog! 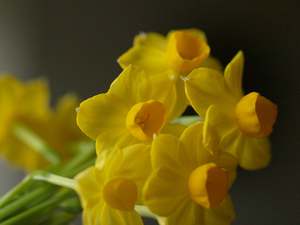 Every morning i walk down stairs into the sweet perfume of tiny, golden narcissi. 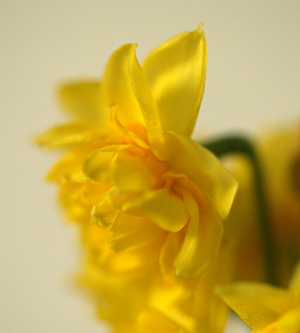 'Golden Rain' and 'Grand Soleil d'Or' are as floriferous as can be and long flowering. My first bowl of 'Golden Rain' were in flower from mid-December through all of January. (i do keep them in the same room where i over-winter lemon trees, rosemary, etc and temps remain cool). 'Chinese sacred lily' is more gangly and had only a few blossoms, but i love them all the same. The hybridizers heard people's complaints (and fretted, no doubt, about lower sales) and have been working to "fix" their bulbs. Next year, i will order an all white that Brent says has become one of his favorites, 'Inbal-an'...a hybrid that he says is similar in appearance to stinky 'Ziva' but with a "pleasant and delicate fragrance"...i'm inclined to trust Brent...but my nose is telling me to wait until i smell for myself. i'll let you know next January if i agree.